Recently, you may have noticed solar energy filling up your news feeds. In 2016, the industry added a record number of new installations and also became one of the leading industries for job creation. Perhaps most importantly though, the cost of solar dropped to an unprecedented low, making it, along with wind power, our cheapest source of energy generation. In addition to the overall drop in cost, new models are emerging for consumers to utilize solar power. As a consumer, you no longer need to worry about the upfront costs and structural concerns associated with adding solar to your roof. The new business model you’ve seen from innovative companies like Uber and Airbnb is coming to energy. 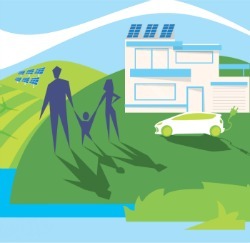 Like Uber’s impact on car ownership, community (or shared) solar models are changing the way consumers look at solar power, moving it from a unattainable, niche source of power to firmly within reach for many previously excluded groups of consumers. Since not everyone that's interested in solar is able to install panels on their roof, these alternative business models are making solar energy accessible for groups like renters, residents of large multi-unit buildings and homeowners with unsuitable roofs (from lack of sun exposure or unideal roof orientation/angle, for example). So what exactly is community solar? There are several types of community solar available to consumers, ranging from neighborhood solar gardens to utility-scale projects. Although definitions do vary somewhat, community solar is essentially any solar installation that provides solar energy and/or the financial benefits from solar energy to more than two members through a voluntary program (which can be either subscription or ownership based). The exact business model can vary from state to state and project to project, but the solar panel arrays are usually owned by either your electric utility, a solar developer or a third-party “special purpose entity”, a non-profit or business enterprise created for the purpose of developing a community-owned shared solar project. Today, utility-owned community solar is the most common model used across the United States. With this model, your local utility owns the solar array and sells or leases panels to subscribers or sells the solar-generated electricity to subscribers at a fixed rate. The latter, it should be noted, is different from green power plans that utilities may offer consumers, wherein participation does not necessarily result in an added solar panel array. Research has shown that upfront costs are the major barrier to solar adoption. Many consumers, while interested in the financial and environmental benefits of solar, feel like the technology is still out of reach for them. Community solar projects can reduce the financial barriers to going solar by aggregating customer demand. Rather than acting alone to purchase panels and hiring professionals for site assessment and installation, community solar programs divide those costs among all of the participants. In addition to significantly reducing the upfront costs, many consumers will see immediate savings on their monthly energy bills. Community solar also brings much needed flexibility to consumers. As a community solar participant, you can buy-in at an amount that works with your budget, and if you were to move, your share in the project can either be transferred to a new home within the same utility service territory or sold to someone else. Your investment is safe even if you can’t stay in one place for long. If you’re interested accessing solar energy but previously thought it inaccessible to you, it may be time to look again. New acquisition models are quickly changing the industry, making it more inclusive than ever before. Elevate Energy What is Community Solar? EnergySage Community Solar: What Is It?